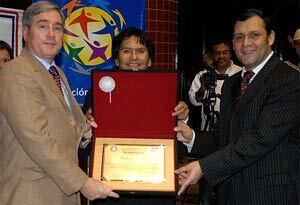 The Global Peace Foundation in Paraguay received a special award May 5, 2011, from the National Congress in recognition of its many activities in the areas of character education and social service. 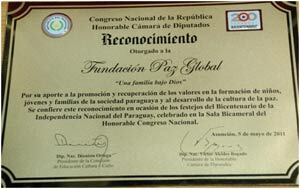 The award was presented during a Bicentennial Ceremony at the National Congress to GPF Paraguay president Thomas Field, by Congressman Victor Bogado, president of the Honorable Chamber of Congress, and Dionisio Ortega, president of congressional commission for education and culture. For its support of the promotion and restoration of values in the formative education of children, youth, and families in Paraguayan society and for the development of a culture of peace. We bestow this acknowledgment on the occasion of the celebration of the Bicentennial of the Independence of the Nation of Paraguay, celebrated in the Bicameral Salon of the Honorable National Congress.